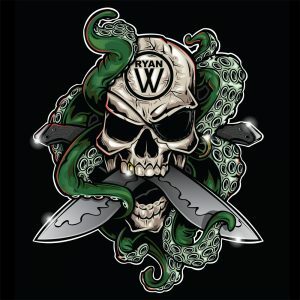 I was made aware of Matt Dyck by my good friends (And Knife Makers) Ben Tendick and Eric Ochs… Matt is in Canada and does Amazing work, Specializing in Pin up and Hot Rod art. He designed a few T-Shirts for Ben and has done some work of Eric as well. 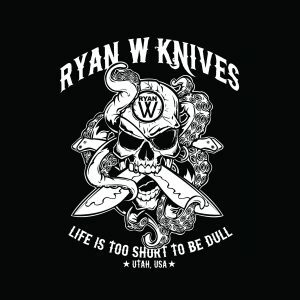 I approached him about doing a new Ryan W. Knives T-Shirt design for 2017. 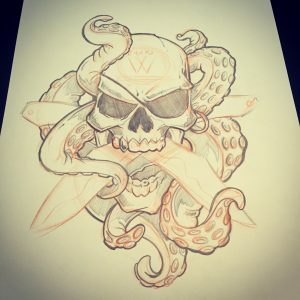 I wanted to impliment my love for SCUBA diving as well, I threw out the idea of a Pirate Skull with some nasty Moray Eels or Octopus enveloping the skull. It also needed some Knives so Crossed Khuk Fighters would be cool. Matt did not disappoint!! In fact he far exceeded my hopes…. This is the Rough concept idea he sent a few days later, I knew I had the right guy for the job immediately!! And the Incredible Finished Full Color Design… WOW!